Today is Valentine’s Day. Millions of dollars will be spent this weekend to buy items such as flowers and candy to express romantic love. God has demonstrated His love to us in a much more profound way. And it is His love—not romantic love, but divine love—that we are to express to one another. Be kind and compassionate to one another, forgiving each other, just as in Christ God forgave you. Be imitators of God, therefore, as dearly loved children, and live a life of love, just as Christ loved us and gave himself up for us as a fragrant offering and sacrifice to God (Ephesians 4:32-5:2). We are to imitate God by loving others just as He has loved us. How can we—God’s children—imitate His love? In this passage, Paul gives us two ways you and I can imitate the love of God. First, live a life of forgiving love (4:32). Even when we are “kind” and “compassionate” to others, people will still hurt us, and we will need to forgive. Think of Jesus. He was perfectly kind and compassionate, yet He was crucified. And while He was hanging on the cross, He prayed, “Father, forgive them” (Luke 23:34). Peter once asked Jesus, “Lord, how many times shall I forgive my brother when he sins against me? Up to seven times?” (Matthew 18:21). Jesus answered Peter’s question by telling a parable. In the parable, a servant is forgiven a huge debt by the king. But later, the same servant refuses to forgive a small debt owed to him by a fellow servant. The king represents God; the servant represents us; the fellow servant represents the people who wrong us. The lesson of the parable? Our forgiveness of others should be without limits (not just seven times!) because that’s how God has forgiven us. We are to forgive one another “just as in Christ God forgave [us].” I am not perfect. You are not perfect. Unfortunately, we are going to do things that hurt one another. That’s why we need to imitate God by living a life of forgiving love. 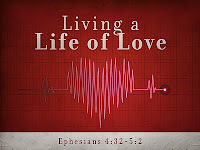 Second, live a life of self-giving love (5:2). The U.S. Greeting Card Association estimates that approximately one billion Valentine’s cards are sent each year worldwide. Christ didn’t send us a card to express His love. He proved His love by giving up His life for us. Costly to Him. It resulted in His suffering and death. Pleasing to God. The sacrifice of Christ’s life was a “fragrant offering.” In the OT, a sacrifice that was pleasing to God was described in this way (cf. Exodus 29:18; Leviticus 1:9). Biblical love is more than just feelings or words. A wife who continually tells her husband, “I love you,” but never shows him her love by her actions, really doesn’t love him. As 1 John 3:18 says, “Let us not love in word or talk but in deed and in truth” (ESV). Love demands that we give of ourselves to others. Most of us already know this. But there is a gap between what we know and what we do. We know that we are to love others. We know we are to be forgiving and self-giving. But many times we don’t do want we know we should do. How can we close this gap? I believe the key is this: We need to constantly fill our minds with the truth of God’s love for us. That’s why Paul doesn’t just say, “Forgive others and make sacrifice for others.” That’s why he links the commands to forgive and give of ourselves to the gospel. He is motivating us to live a life of love by appealing to what God has done for us. God the Father forgave all of our sin. God the Son gave himself up for us. And we don’t deserve this amazing love. If our minds our filled with thoughts of God’s love, His love will start to move from our minds and into our actions. You are a dearly loved child of God. Imitate your heavenly Father. Forgive others “just as in Christ God forgave you.” Give of yourself to others “just as Christ loved us and gave himself up for us.” Live a life of love.